The ferry connection between Heraklion (Crete) and Santorini (Thira) is a seasonal route, but a very popular one. From mid-April to late October, you can expect multiple daily itineraries, most of them departing in the morning from Heraklion port, and returning in the afternoon. In the low season between October and March, this connection is covered rather infrequently by older, conventional ferries. As you can see below, the minimum fare range for an adult is €28-€45 for a standard ticket, and the trip duration varies from 1h45m (high-speed ferries) to 5h55m (conventional ferry). How often do ferries connect Heraklion to Santorini? The ferry connection from Heraklion, Crete to Santorini is running throughout the year. During winter this route is served once or twice a week, while during summer season (from April till October) there are more ferries operating on this route on a daily basis. As this is a quite popular route, there are many ferry companies and many different ferry boats connecting Heraklion and Santorini. Most of them announce their ferry schedules late on the previous year or in the first months of each year (January or February). During high season, there are several ferries going back and forth every day. The time schedules may be altered a bit and you should expect some minor delays as the ferries are calling also at intermediate ports. Santorini is located quite close to Heraklion. The actual distance from Heraklion to Santorini is 120km or else 75 miles (65 nautical miles). The high-speed catamarans operating on this crossing during the summer season, perform the trip in less than 2 hours. Weather can play a role in trip duration though, as, in windy days the trip duration might be extended by as much as one hour for these vessels. As this is a quite popular or even crowded ferry route, the most important thing is to be quick and buy your ferry tickets. We advise you to book your tickets at least three months prior to your trip as this is a very busy route during summer. Ferryhopper is here to help you find all the possible options; it is up to you to choose the perfect one and book it while there is still availability. The ferry schedules are planned with day trips in mind. The first ferry departs from Heraklion at 7:30 am, and returns back to Heraklion late in the afternoon, at around 8:00 pm (departing from Santorini at 6:00 pm). This allows travelers to organize day trips without the need of booking accommodations and spending the night in Santorini. At which port of Santorini do I arrive? You are arriving at the port of Athinios. Santorini (or Thira) has only one port that serves passenger ferries and this port is located on the middle-west side of the island. The port of Santorini gets really crowded during high season. Make sure to arrive there at least one hour prior to your scheduled departure. If you visit Santorini only for a day, be sure to rent a vehicle, to explore as much as possible. Island hopping around Santorini is the best! Check our Ferry Maps to discover nearby islands. 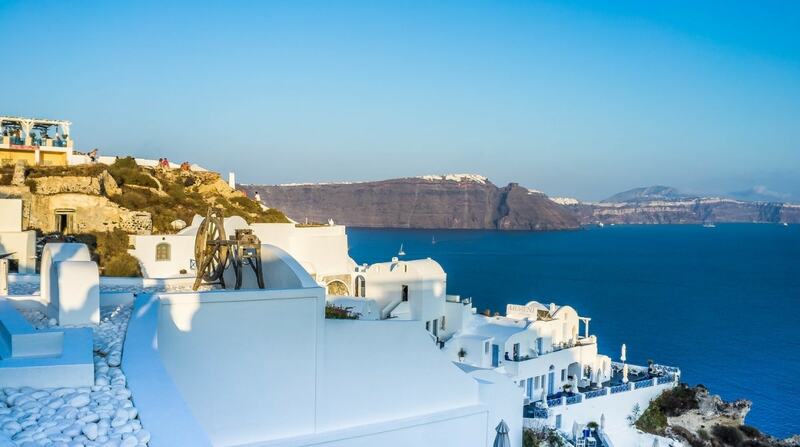 Tickets to Santorini always sell out fast during high-season. If you are planning to take a ferry from Heraklion to Santorini on late July or August, make sure to book your tickets well in advance. During summer there are also itineraries connecting Heraklion to Mykonos. You can find more information concerning the ferry route connecting Heraklion to Mykonos here.